Speak directly to a visitor in real-time via Video Call App. Visitor and host can communicate using face-to-face or face-to-voice mode. Replace the expensive and outdated intercom system. 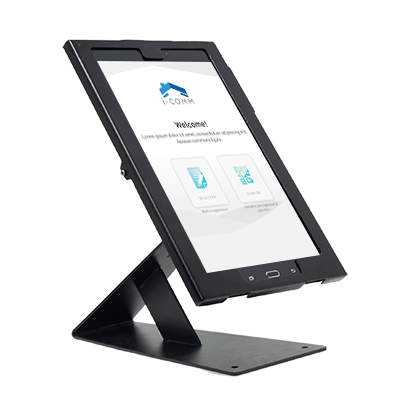 Offer visitors with self-service Visitor Management panel/kiosk. Cut operating cost by reducing the need for manpower (guard and receptionist). All visits are authorized by tenants complete with audit trail records. Visual proof of visitors is recorded for security reference. 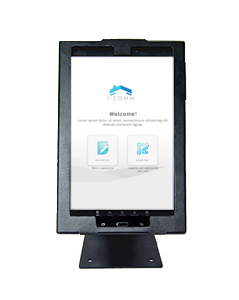 Integrate and interact with i-Vizit Guard Panel for Visitor Access Control automation. Integrate with i-Vizit to reduce visitor waiting time. To integrate with BLE-2, BLE-5 & BLE-16 to automate visitor access control. Apply to pre registered or walk-in visitors in fully or semi-automated environment. i-Comm tablet comes with DIY desktop panel. NOTE: Video call rates will be charged separately, contact us to learn more.